Selamat datang ke Kampung Padang Tengir. 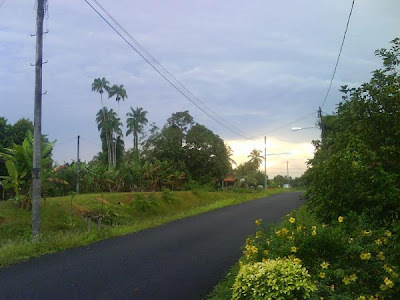 Located at Manir, Kuala Terengganu, Malaysia .In my village there are a lot of trees. In my village also found drain .My village located between Kampung Durian Mas and Kampung Padang Machang. My village also have a one restourant. 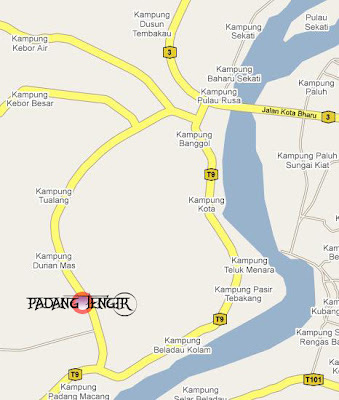 We call the restourant as a Mee Sup Wahab Kampung Padang Machang. The restourant start business from 5.00 p.m. Many people will come at maghrib time to eat. Because at maghrib a lot of setan like to join after the client merempit at padang kebor.. But, The waiter late to take the order. We all so hungry and angry..' menyampah i !! 'say customer to waiter' ' After one hour one mangkuk mee sup daging finally has coming.. ' i like it..!! say client'. But the Mee sup Wahab is still we all Favourite Soup forever and Ever.. HAHA..SINCE WHEN MEE SUP WAHAB LOCATED IN PADANG TENGIR? IT BELONG TO PADANG MACHANG..